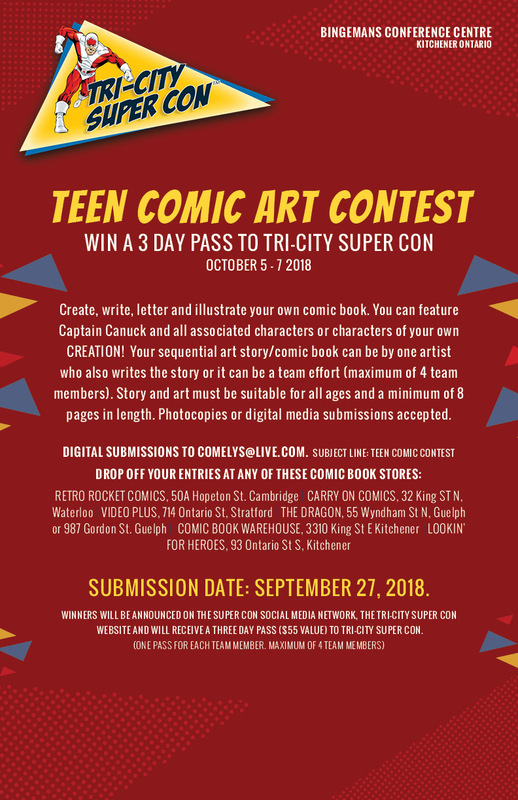 Win one of 5 three day passes to Tri-City Super Con! The first five Waterloo Region Record subscribers to correctly solve and submit this geography/history/mathematical quiz tocomelys@live.com will win one of five 3 day passes. Contestants must be 18 and older and must send the answer with RECORD QUIZ in the subject line. Name, address and phone number must be included with the answer in order to qualify. Admission to Super Con is free for children 12 and under (maximum 2 children per paying adult). 3 Day Passes are $55. Passes can be purchased at any Little Short Stop or here. In what year did confederation take place in Canada? In what year was our present Canadian flag introduced? What year was the first edition of Captain Canuck published? Win an inaugural Super Con tote bag loaded with Captain Canuck items! Bring your completed Captain Canuck colouring contest artwork featured in The Waterloo Region Record to Super Con and win an inaugural Super Con tote bag loaded with Captain Canuck items valued at $40. Prizes will be awarded to the first 10 entries brought to the Tri-City Super Con registration table at Bingemans October 5, 6 or 7. Admission to Super Con is free for children 12 and under (maximum 2 children per paying adult). Limited to one prize tote bag per family.